The RAE, or “Real Academia Española” (Royal Spanish Academy) is the most important Spanish language regulatory body. In English, we don’t exactly have one regulatory body that can claim to be the authoritative regulatory body in terms of the English language, but the RAE can be compared to the Oxford English Dictionary, published by the Oxford University Press, in terms of prestige and influence over the rest of the English-speaking community. 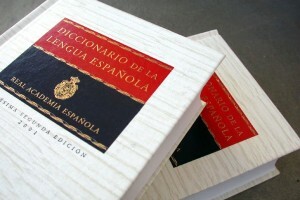 That being cleared up, the RAE has recently decided that a few terms and phrases that play with the idea of gender in Spanish are not, in fact, acceptable forms and won’t be added to the DRAE (also known as the “diccionario de la lengua española”). The reasoning behind the creation of the phrase “todos y todas,” famously used by the former president of Argentina Cristina Kirchner, is that inclusivity is important. The term “todos” means “everyone” in Spanish, in this context, and grammatically it includes all genders, even though it has a masculine (-os) ending. The idea behind grammatical changes like “todos y todas” is to make sure women don’t feel overshadowed and invisible when people are talking in general terms. Ignacio Bosque, author of an RAE report titled “Sexismo lingüístico y la visibilidad de la mujer” (Linguistic sexism and women’s visibility) argues that, since “todos” and many other plural masculine terms, like “profesores”, grammatically includes women, so there is no need to create new terms. The use of the masculine grammatical gender as also gender neutral is very much a part of Spanish grammar, as it is with many Romance languages and even English (mankind, firemen, etc.). However, just because one person with a lot of clout in the RAE says they think it doesn’t make sense to incorporate these new gender-inclusive terms into the lexicon doesn’t mean that they are necessarily right. As anyone who has studied linguistics knows, language does shape how we think as a culture. To have terms that do not suggest that “male” is the default could greatly benefit a society that continues to push the idea that masculine is better and the norm. If we can step away from this and at least include everyone in a term, making it truly gender neutral, many people would feel that their identities are being validated and feel like they do have a voice. Using “todos y todas” instead is a good step forward, as it includes feminine-identified people as well, but ideally terms would be genderless, as we have worked on in English with examples such as “police officer” and “businessperson”. Moving towards language that doesn’t refer to gender at all could contribute to the creation of a society that doesn’t pay attention to gender as much in terms of who gets to have what position and issues like that. We won’t be able to erase years and years of using masculine terms as default ones and thus erasing many people’s identities, but “todos y todas” was a step in the right direction and should be reconsidered at least. It isn’t a perfect solution, but it could create more awareness and instigate some change. Language is powerful and we need to use it wisely. For an overview of Alpha Omega Translations’ expertise, visit our legal translation service page.